When you are on the five in one Medifast plan, you are allowed one cooked meal per day or twenty-four hour period. You are thinking that is better be pretty darned good if that is the only hot home cooked meal you get during your diet program. Fortunately, there are Medifast recipes that are over the top in nutritional value, and flavor. You may be an aficionado of hot sauce, and this will play well into any Lean and Green Recipes that you prepared. Usually hot or spicy items like Tabasco are all flavor and no fluff in the weight gain department. Medifast diet recipes are sold in book form, and by some third party support companies in the form of website memberships. There are plenty of freebie Medifast recipes on the Internet to keep a smile on your face the tummy rumble down to a minimum. All these recipes are very basic, and quick to make so you will not be slaving over the stove when you get home from work. Several dieter have said they like to make a couple of days worth of meals up so they can just pop them in the toaster oven over microwave when the return home at the ending of a tiring day. 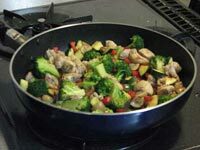 Sauté the broccoli crowns first until tender, then add the rest of the ingredients and cook on medium high heat while constantly stirring. Cook until the meat is done to your liking. As always this is just enough for you, so double it if your spouse wants to take part in the same meal with you.